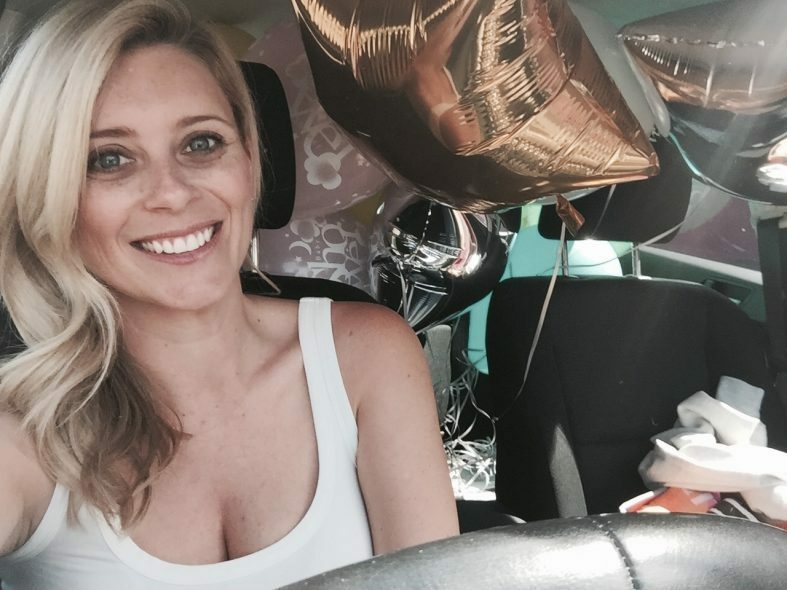 A baby shower is a time to celebrate new life and share advice on parenting (well, advice from those who are already parents … I tend to let the team down on that front!) as well as a great chance for the mum-to-be to catch up with friends before life gets too crazy! 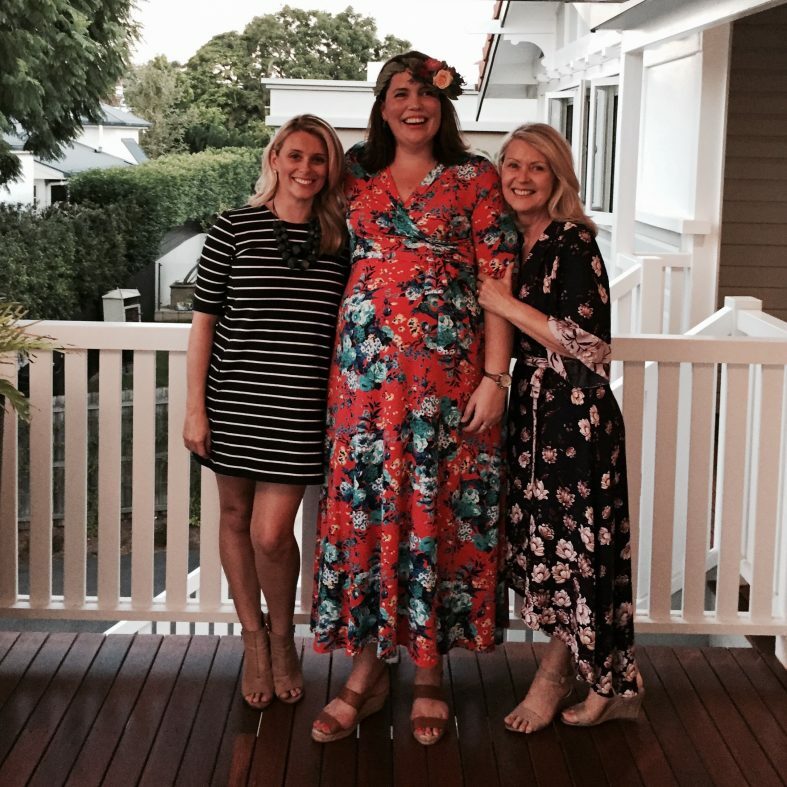 Last weekend, my mum and I threw a baby shower for one of my closest friends, Jane who is just six weeks away from the birth of her first baby! 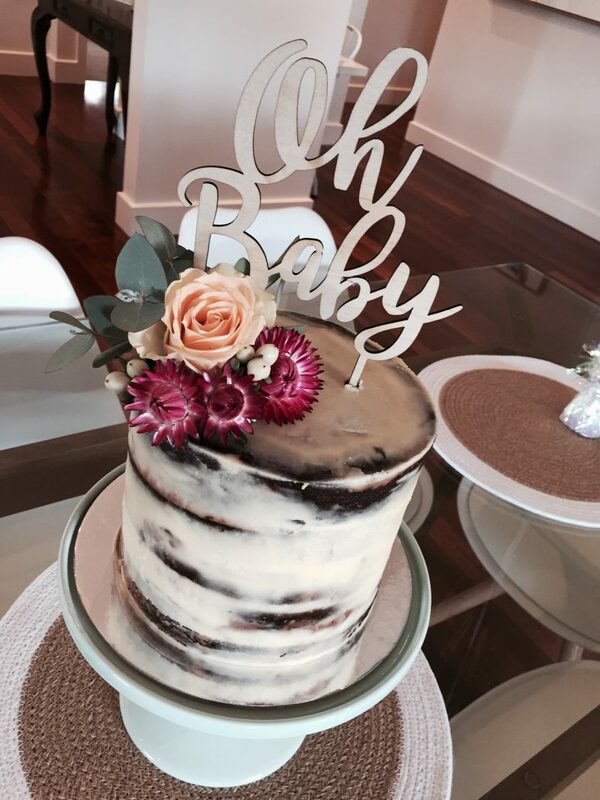 Here, I share my party-planning tips and tricks for how to plan a lovely baby shower. 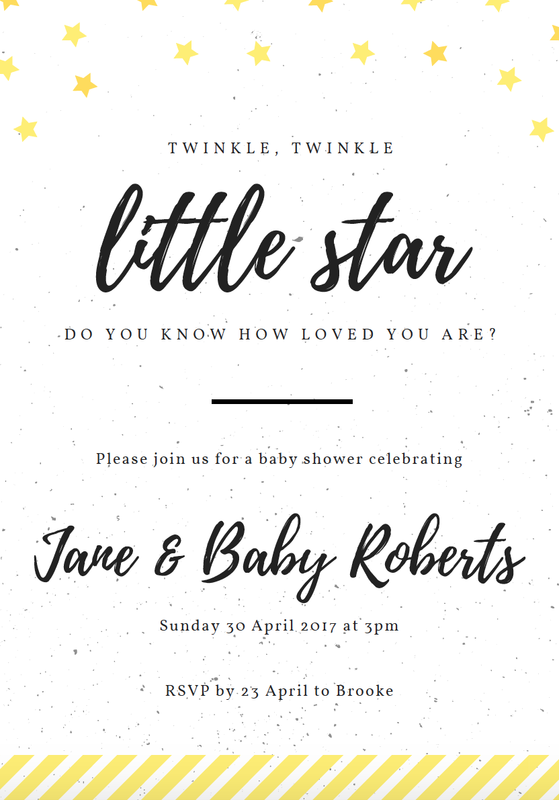 Baby showers are usually held in the third trimester, somewhere around the 32- to 34-week mark, when the pregnancy is well established, but not too close to the due date – otherwise you risk the guest of honour going into labour or missing it entirely! We followed this tradition as Jane celebrates 34 weeks today. We also timed it to coincide with the long weekend which gave her mum and sister a chance to fly in for the celebration. To keep costs down, I designed an e-card invitation using Canva and emailed it to all the guests. Traditionally held in the host’s home, baby showers are now celebrating over brunch, lunch or high tea, often at cafés and restaurants. The best part of having the event at a café or restaurant is that set-up and the clean up are someone else’s problem. Knowing how loud things tend to get when all my friends get together, we decided to have the party at my mum’s house so we could enjoy afternoon tea on the deck in the autumn sunshine. No one – including Jane – knows whether bub is a boy or a girl, but we didn’t really want to go with yellow as it can be so … yellow (you know what I mean? ), so we opted for a Tiffany turquoise colour theme. We picked up paper plates and napkins in turquoise from Spotlight, as well as some lolly bags and pastel baby shower balloons. Our baby shower was set for late afternoon, 3pm to 5pm, so we planned a mix of finger food and sweet treats. We had a mix of sandwiches (ham and wholegrain mustard, and egg), vegetable frittatas, brownies, passionfruit slice, party pies (because it’s not a real party without party pies! ), and spinach dip. To keep the budget under control, we also took advantage of some of the lovely friends who offered to bring food, asking them to bring a cheese and fruit platter, scones with jam and cream and the delicious homemade ‘peach blossoms’ from Jane’s mum. For drinks, we bought a couple of bottles of rosé and sparkling wine as well as a classic non alcoholic fruit punch (Sunshine Punch, Ginger Ale and Lemonade, topped with fresh fruit). 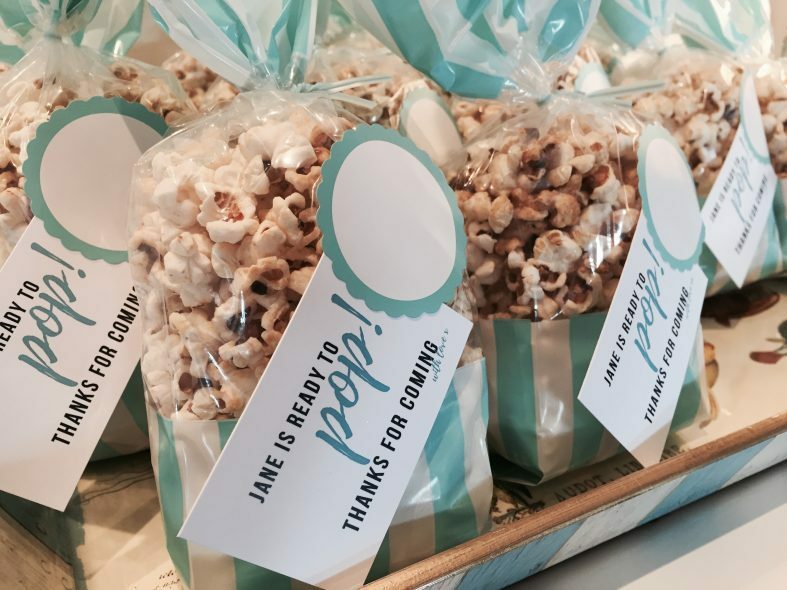 We also filled party bags with popcorn as a little thank you gift for each guest. Let’s be honest, a celebration without cake is just a meeting – and when the guest of honour is a cake maker, there could only be one centrepiece for the party! Despite being 34 weeks pregnant and still working full-time, Jane offered to make her own cake (thankfully, because making a cake for a cake maker is one of those terrifying things!). She whipped up a naked chocolate sour cream cake with Nutella swiss meringue buttercream topped with flowers from The White Bungalow (which matched Jane’s floral headpiece). You can see more of Jane’s masterpieces on her Instagram account, Miss Jane’s Cakes. Playing silly games is a pretty traditional part of any baby shower. Of course, there is no rule which says you have to do so, but it can add another element to the event. I was adamant there wouldn’t be any baby food eating or fake poop/chocolate bar sniffing, but we did play three quick games, starting with Guess The Jellybeans in the Bottle. This is by far the easiest game to organise as all you need to do is get a cheap bottle and fill it with jellybeans (I counted them as I put them in as there were 127) … the winner was mum-to-be Jane, who guessed 124. Next up was Name That Song which featured about a dozen songs featuring the word ‘baby’. I’ve uploaded my list of songs here and the answers here. The last game was Who Is My Baby where guests had to match a list of celebrity parents with their babies. You can download my Who Is My Baby list here. And the answers here. Mum bought cheap takeaway containers so we could send people home with a doggy bag for the fellas and kids who didn’t get to come to the party. This also meant we weren’t left with large amounts of food to eat! If you fill balloons with helium and then need to transport them in the car, put them into large garbage bags and then put a beach towel on top to hold them down so you can still see out your rear view mirror and windows!